We, at Touchstone, believe that any event, whether hosted by corporates or individuals, is an extension of their personality and hence demands detailed attention and fine execution. Of the innumerable things that India has shown and taught the world, celebrating occasions or festivals is probably the most significant. The sheer style, décor, celebration and grandeur of Indian events especially the stunning weddings continue to astonish the world. Touchstone believes such a legacy must be upheld and offers a wide range of Private Event Services for your family and loved ones. Gifting, in recent times has emerged as one of the most convenient and widely used modes of connecting with business partners, clients, employees and friends. 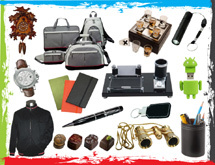 Conventional gifting ideas have paved way for theme based and innovative gifting ideas that carry a message with them. They signify an occasion or the event for which the gift is being offered. To assist you in effortlessly selecting the right gift for the right person for the right occasion, Touchstone offers you innovative and refreshing ideas within your specified requirements and constraints. "Thank you for the excellent service provided for Diary 2016, we have received positive comments." - Smitha R., HR, Huawei Technologies India Pvt. Ltd.
"Do What You Do Best And Leave Us The Rest"
Touchstone was incorporated in 2009 in Bangalore, India, to serve as a confluence of excellence in services such as Event Management, Gifting, Printing, Travel, Marketing, Advertising, Public Relations and many more. Even though there are several organisations that cater to each of these needs individually, we serve as a one stop shop. Touchstone bridges this gap, by bringing together the very best of each industry on one platform and then offering the whole package to our clients, allowing them to effortlessly focus on their core business areas. What is ‘The Next Level Of Convenience’? Total Convenience: Array of services available under one roof, saving time and effort spent in approaching multiple agencies. Expertise: Proficient knowledge and valuable experience in each of the services we offer. Economical: Able to offer maximum value for money by dispensing diverse services under one roof, less vendors hence lesser cost. Flexibility: Selection between either standard or customized offerings to suit our client’s specific requirements. Efficiency: Achieved through timely execution and delivery of services, thereby saving valuable time and money for our clients.